There is a great need to gather data from vast populations to better understand the distribution of Parkinson’s disease and the variation in its symptoms, ultimately to aid in its diagnosis, determination of symptom severity, and prediction of disease progression in individuals. Toward these ends, we propose to take the most commonly administered Parkinson’s questionnaire and make it universally intelligible across languages, cultures, and education levels, as well as intuitive and engaging, by creating and evaluating a “Visual Parkinson’s Disease Rating Scale” (VPDRS). To administer a consistent and widely accessible implementation of the VPDRS to Parkinson’s patients in the U.S. and in India, we will deploy it on a mobile phone application, and store the data on server technology that we have developed and will establish in India for managing large-scale data collection from mobile devices in future studies. Make the most commonly used Parkinson’s disease rating scale universally intelligible across languages, cultures, and education levels, as well as intuitive and engaging, by creating a visual analog of the questions, the “Visual Parkinson’s Disease Rating Scale” (VPDRS). For some questions, it will suffice to portray the condition outright, such as with problems with sleep, eating, dressing, hygiene, etc. For behavioral or cognitive conditions that do not have a clearly outward expression, such as pain, light headedness, etc., we will employ the most universally intelligible semiotics in Indian and U.S. children’s comics. Improve the VPDRS visuals’ comprehensibility after evaluating them through clinical observations of English- and non-English-speaking patients and controls in India and the U.S. For each revised visual, the participant selects one of five images. If the VPDRS score is similar to the corresponding text-based rating scale score, then we consider the VPDRS’s visual representation to approximate the text-based question. Deploy the VPDRS in a mobile phone application, and store collected data on server technology we have developed and will establish in India for managing data collection from mobile devices in future studies. Facilitate future studies between Indian and U.S. collaborators by holding governance/consent discussions across institutions, with a goal of incorporating our fully electronic consent process in the VPDRS app for future epidemiological studies. High Performance Computing Resources: Sage Bionetworks uses a combination of scalable cloud-based storage and analytical computational resources and its own computational facilities. The cloud-based services are procured from Amazon Web services on a fee for service basis and provide a cost-effective solution to variable needs, technology upgrades and support. Sage Bionetworks develops and operates two software as a service platforms, Bridge and Synapse, as resources for the broader scientific community. Both these systems opperate on cloud-based infrastructure. Internal research projects also have access to the Sage Bionetworks high performance computing cluster, maintained through a partnership agreement with the University of Miami. Additional servers used by Sage scientific staff are co-located at the Fred Hutchinson Cancer Research Center computing facilities. All networked file systems, databases, and home directories are backed up using Veritas software to a robotic tape library. Tapes are taken off-site each month for disaster recovery. Additional facilities/resources: We will use server-side technology called Bridge for this project. Bridge is designed to support the design and execution of adaptive clinical trials delivered though smartphone platforms. Participants in a study interact with the Bridge server through an app which is custom-designed for each particular study. The Bridge server provides a way to configure a study with a set of survey questions to ask study participants and way to schedule times for the various survey and app data collection tasks to run. Storing this configuration on the server allows researchers to dynamically adjust the study as data is collected without distributing new builds of the app to participants. The Bridge server provides services for study participants to create an account, authenticate, and manage informed consent to participate in a research study. The app will periodically save survey and sensor measurements to the server; client-side SDKs help manage transmission of his data over intermittent mobile network connections. Study data is stored separately from readily identifying user account data so that study participants can be deidentified and data shared protecting their anonymity. Once deidentified, study data will be stored on Sage Bionetworks Synapse platform. Sage Bionetworks Synapse platform will be used to support the complex, interrelated analyses described in this project. Synapse is an informatics platform for collaborative, data-driven science that combines the power of community-based modeling and analysis with broad access to large datasets, which will enable the development of more predictive computational models of disease. Synapse is built as a web service-based architecture in which a common set of services is accessed via different sets of client applications, including a web portal and integrations with multiple analysis environments. Synapse is designed to allow users to bundle together and publish the relationships, annotations, and descriptions of files that may live in multiple locations. This may be files stored in Synapse own native storage location (Amazon S3), data living on local file systems, or code from GitHub. As long as the storage location is accessible via http/ftp it can be accessed through Synapse. Synapse includes analysis clients for users working in the R and Python programming languages, and a tool that runs at the program line of the Linux shell, providing basic functionality to interact with the system no matter what analysis tools the analyst would like to use. These tools allow users to query and load data, post results, and create provenance records directly from the command line. The output of any analysis can be stored in the Synapse Amazon S3, or externally and indexed in Synapse just as the underlying data. The Synapse web portal is an environment for sharing data, results, methods and tools, and is a place that enables the tracking of analysis steps and publication of analysis results to collaborators and eventually the broader community. The Synapse web portal will allow researchers to publish analysis results and track project information. A Provenance visualization tool will allow users to formally track the relationship among resources in the system and better document and communicate each analysis step. The Synapse system is operated as a hosted service offering from Sage Bionetworks, requiring no installation of software or IT burden on the collaborating institutions. Researchers will be able to create accounts in the system and immediately use the system to collaborate. At this time Synapse is hosted at http://synapse.org, and is being used to host a variety of bio-molecular data sets and analytical pipelines to curate this data. Sage Bionetworks has successfully used Synapse to support a number of large scale collaborative projects including open challenges in the predictive modeling of breast cancer survival and the TCGA Pan-Cancer working group. Scientific Environment: Sage Bionetworks leases approximately 3,900 sq ft of office space on the Fred Hutchinson Cancer Research Center campus (FHCRC or the Center.) As part of the agreement with FHCRC, all Sage Bionetworks staff have full access to the Center’s research. Sage Bionetworks has a services agreement with FHCRC for facilities related logistics. High quality patient evaluation and care and High patient load: AIIMS is a tertiary care teaching hospital which came into existance through an act of parliament> It is a state funded hospital which provides free medical care to patients who come from all over the country and neighbouring countries as well.it has three major objectives, 1) Teaching : to provide medical teachers to the country by providing bet training and teaching to medical, nursing and allied health workers 2) Research: to provide facilities for research and promote research 3) Patient care: To provide best, state of art treatment to all without prejudice or ability to pay. In the Neurology department with a faculty streangth of only 11 we provide out patient service every day where on an average 200-300 new patients and about 600-700 patients on follow up visit are seen evey day in Neurology outpatients. Indoor service is available to 68 regular general beds+ 5 ICU care + 5 Epilepsy monitoring beds + 3 sleep medicine beds. In addition there are some paid beds, which are not fixed and range from 2-10 at any given time. Neurology department runs speciality clinics for stroke, Neuro-immunological disorders, Intractable epilepsy, Movememnt disorders, neuro-muscular disorders, sleep disorders, memory clinic, headche clinic and ataxia clinic. All services are run on a free for service basis and provide free consultation and some basic treatment to all patients. In all the special clinics state of art assessment and treatment is provided. In movement disorders clinic, where on we register more than 1200 new cases per year, and abot 3000 extra cases are seen who had been registered earlier on follow up. The frequency of follow up is variable from once evry 4 months to once a year depending on cases to case and place of residence. We have facilities for round the clock laboratory support, Imaging including CT scan, 1.5 T MRI scan, PET scan, SPECT scan, fMRI services and electrophysiology with evoked potential, video EEG and EMG etc.We are routinely doing genetic study for ataxias and HD. Additional facilities/resources: We use Pacs service for storing and archival of all imaging investigations. The hospital hasehospital system and the whole hospital has its own wi-fi. Our IT support staff may be able to help us link to the Bridge server which will be used in the project to allow participants to create an account, authenticate, and manage informed consent to participate in a research study. This may then be able to work in sync with the app and will periodically save survey and sensor measurements to the server; client-side SDKs help manage transmission of his data over intermittent mobile network connections. Study data is stored separately from readily identifying user account data so that study participants can be deidentified and data shared protecting their anonymity. Once deidentified, study data will be stored on Sage Bionetworks Synapse platform. Scientific Environment: We have a very conducive environment to do research which is encouraged by the administration and the Director. The Institue provides incentives to young scientists to do extramural projects. The Government of India also has several schemes to promote science and scientists in India. In the said scheme Dr. Behari has received the woman Bio-scientist of the year award from Department of BioTechnology, Government of India. The Nizam's Institute of Medical Sciences shortly NIMS is a premier institute and autonomous university in Hyderabad, Telangana, India. It is established under the Act of Andhra Pradesh State Legislature. NIMS is recognized by University Grants Commission and Medical Council of India. It is administered under the supervision of Governing Council, Executive Board, Director and other statutory bodies. The institute is located in Punjagutta area at the prime center of the twin cities and spread over an area of about 23 acres (93,000 m2). It has the constructed area of more than six lakh sq.ft. The Institute serves through 27 Departments. Out of them, 14 are Super Specialties and others are Supporting Departments. The Institute has a bed strength of 2000 beds, out of which 1200 are in General Wards, 166 in private rooms and 177 in emergency and post operative care. It publishes the monthly journal "The Clinical Proceedings of Nizam's Institute of Medical Sciences" for the last 20 years. The Medical institute has modern facilities and updated amenities. The hospital is well equipped with latest medical tools, instruments and technology. The staff members maintain a good cooperation and build trust among the patients. Every patient is treated like a family member and ensured that they get well soon. The staff members of the medical institute comprises of 19 Medical Officers & Senior Medical Officers, 10 Lecturers (Nursing and Physiotherapy), 183 Ministerial, 283 Paramedical, 465 Nursing, 85 Class IV, 5 Consolidated Staffs, about 900 Fessey workers and few more. The hospital has been consistently maintaining a very good patient doctor ratio of about 3:1. Presently, NIMS, Hyderabad has 1000 beds. Out of these, 686 are in General Wards, 139 in Private Rooms and 175 in Emergency and Post Operative Care. The average number of out patients visiting the hospital per month is about 32,000 and the number of in-patients admitted per month is about 2,600. The average bed occupancy is over 89%. In a year, more than 25,000 surgeries takes place at the hospital. Out of which, about 8,000 are major operations, 16,000 are minor operations and 2,000 are emergency operations. The department functions like a model hospital and caters all the facilities round the clock. The Emergency Department in the Medical institute is strictly maintained for the emergency cases. This ward contains about 36 beds, a separate Lab, X-ray machine, ECG machine. It is looked after by a Chief Medical Officer and Duty Medical Officers. Senior Residents from General Medicine, Orthopaedics, Cardiology, Neurology are available here. The patient is treated immediately. Once the patient is out of danger, the further treatment is continued in the concerned department. Some patients get direct discharge from the emergency department depending on their physical condition. Out-Patients are also given as much important as the In-patients. Nizam's Institute of Medical Sciences is an autonomous medical university in Hyderabad, Andhra Pradesh, India. Initally run as an orthopaedic hospital from 1961, it was established as a superspeciality University from 1989. A state run University, it has a bed strength of 1035. The University has 29 departments. The University is a referral centre providing excellent medical care and runs extensive educational programmes for post graduate training in various medical superspecialities as well as encourages and facilitates research in various clinical fields. The Department of Neurology has 8 consultants interested in various spheres of the speciality. The Neurology outpatient department has almost 300 patients/ day with an inpatient total of 70 patients. It runs an active 3 year DM programme with 8 residents/ year as well as 1-2 PhD students. The Department has active clinical, genetic research programmes in the areas of movement disorders, stroke, dementia, epilepsy and multiple sclerosis in collaboration with other departments. We also have a strong research team and as a University hospital a good academic center. We have DCGI approved Ethics Committee.In India we have onerous patient and teaching responsibilities which limit our abilities to publish more papers. ZMQ Software Systems is a Technology for Development Social Enterprise established in the year 1998. The organization was founded by Hilmi Quraishi, Ashoka fellow, and Subhi Quraishi with a mission to use technology – ICTs and Mobile Telephone to bridge the digital-divide by building system change solutions for the communities and unmet needs. ZMQ specializes in developing solutions in the areas of public health, education, skills development & training, enterprise development & livelihood generation, environment, disaster management and agriculture. The core competencies of the company are developing eLearning, Gaming, Edutainment, Knowledge Management, Human Performance solutions; and customized applications & software. ZMQ has capability to develop solutions on wide variety of technologies from Internet, Intranet, Stand-alone to Hand-held & Mobile Devices. ZMQ provides effective and affordable solutions to Governments, Development Agencies, International Organizations, NGOs, Research Institutes and socially conscious Corporate. The organization is also focused on developing social ICT products for new markets of the world at the Bottom-of-the-Pyramid (BOP) by successfully reaching out to grass-root, under-privileged, and marginalized communities; based on viable and self-sustaining business models in support of the social cause. ZMQ has already developed over 80 Behaviour Change Communication projects using social mobile games and 20 system changing projects on critical health issues like HIV/AIDS, Tuberculosis, Polio, MCH, SRH, Life-skills, ARH, FP, Mental Health and RMNCH+A. ZMQ is a Technology for Development Social Enterprise. The organization develops innovative ICT solutions, software, and applications for empowering people and enabling sustainable development. ZMQ is a member of Global Business Coalition on HIV/AIDS, Tuberculosis and Malaria (GBC). Global Business Coalition is the pre-eminent organization based in New York, leading the business fight against HIV/AIDS, Tuberculosis and Malaria.ZMQ develops lot of database management systems like MIS and CMS. One of the specialization of ZMQ is to develop multi-hierarchical systems with different permissions to admin and the users at different level of the software. ZMQ develops exciting and engaging 2D/3D mobile games for wide variety of devices for different platforms such as Java, BREW, Symbian, iPhones, Pocket PC and Palm OS. The company has a strong research team which continuously engages in studying database and other new technologies to make systems robust and efficient. Apart from this, ZMQ also excavates and creates lost games of different ethnic communities of the world. In all these solutions, ZMQ uses database systems at the backend to connect it with the application to submit and record various activities. The company also provides services for porting games to different standards and devices. And other web and mobile technologies. If we get a chance to make a presentation on front of the committee, we will demo lot of working samples on the content management system, integrated management information system, health management system and various client management systems. Offices in other countries, when established, services offered by the local office, and number of employees: No office in any other country except India. ZMQ develops technology solutions for the developing sector. It has 46 full time employees and 53 part-time employees. Phone (M): +91-9810728148; Address: 187, Vaishali, Pitampura, New Delhi 110088, India. The Clinical Trials Coordination Center (CTCC) is a research unit of the Center for Human Experimental Therapeutics (CHET) in the University of Rochester Medical School specializing in the development, management and conduct of human clinical trials. CTCC/CHET initiated operations in 1987 to organize and manage an NIH-sponsored trial for Parkinson’s disease (DATATOP) that involved 800 trial participants enrolled from 27 contributing academic research centers. Today, CTCC/CHET provides a full portfolio of project management, data management and site monitoring services to industry and government sponsors. CTCC/CHET is utilized by a number of investigator-initiated, collaborative research groups including the Parkinson Study Group (PSG), Huntington Study Group (HSG), Neuro-Ophthalmology Research Disease Investigator Consortium (NORDIC), Collaborative Clinical Research Network in Friedreich’s Ataxia (CCRN), and the NINDS Exploratory Trials in Parkinson Disease (NET-PD). These study groups are made up of over 500 research scientists and coordinators throughout the United States, Canada, Australia, New Zealand, South America and parts of Europe. To date, CTCC/CHET has provided project coordination, data management services and site monitoring for more than 100 multi-centered, controlled clinical trials that have included more than 38,000 trial participants. Six novel treatments have been brought to market and are available to patients due in part to clinical trials that have been coordinated and performed through CTCC/CHET. CTCC/CHET growth and success has come about through continual evolution in regulatory compliant operational processes and the introduction of leading edge technical capabilities that enable efficient and effective clinical research services. Services routinely performed by CTCC/CHET include: protocol design and development, site recruitment and management, study participant recruitment and retention strategies, quality assurance and regulatory compliance training, clinical trial database design, operational data acquisition, processing and query resolution, administrative and clinical data reporting, site monitoring, structuring of project governance and data safety monitoring committees, and overall financial and administrative project management. The CTCC/CHET currently employs 74 staff delineated by function group. These groups include Senior Management Team, Project Managers, Site Monitors, Statisticians, Medical Faculty and Fellows, Database Managers, Information Technology Support, Information Analysts, Forms Design Specialists, Administration and Finance, and Meeting Planners. All CTCC staff are devoted 100% to the design, implementation, conduct and reporting associated with clinical research. All staff activities are conducted in accordance with Standard Operating Procedures (SOPs) and Guidelines which are maintained, reviewed and implemented to conform to expected industry best practice and regulatory guidelines. CTCC maintains an active staff education program, including areas such as Good Clinical Practices, disease education, legal issues such as copyright, HIPAA and database ownership, technical computer training and other topics. Key CTCC personnel are certified through the University of Rochester Human Subjects Protection Program (HSPP). All CTCC staff sign confidentiality and conflict of interest agreements on an annual basis as a condition of their employment in order to protect confidential research information and to protect against the improper use of sensitive information. CTCC/CHET is located in the Saunders Research Building on the University of Rochester Medical Center campus, presently occupying a suite of approximately 13,586 sq ft. The Saunders Research Building is a four story building designed to accelerate the initiation, implementation and completion of translational research. All CTCC/CHET offices are located behind secure doors, locked at all times, including during normal business hours with only designated staff having swipe access. Paper files are maintained in study specific filing cabinets. Where paper-based case report forms are utilized, they are stored in a secure central filing area outfitted with a sprinkler system in fire resistant, lockable cabinets. Each staff member has swipe access to the secure office space in which they need to work, enabling access 24 hours per day, 365 days per year. CTCC/CHET has state of the art telecommunications capabilities facilitating highly effective and timely access to CTCC personnel 24 hours per day and 365 days per year as may be required for medical emergencies. Each CTCC/CHET staff member is assigned a direct inward dial phone line with rollover capabilities to voicemail or to a secretarial pool as may be required. Medical monitoring personnel and other selected CTCC/CHET staff have connectivity via cellular technologies such as smartphones, tablets, portable wifi access points, and/or broadband cards. The CTCC/CHET office telephone system can be programmed to forward office calls to cell phones. World-wide secure access to CTCC/CHET email, calendaring, and phone contact lists for medical monitoring and other select CTCC/CHET staff is provided through mobile enterprise messaging technology via approved devices. In addition, the organization has direct inward dial toll free (1-800 or 1-888) telephone lines for use on trials as may be required (e.g. as an aid during the recruitment phase of trials to educate and inform potential participants regarding the study opportunity). CTCC/CHET has dedicated video-conferencing and teleconferencing capability based upon contemporary Polycom equipment and Skype video-conferencing software. The one-to-one Skype video-conferencing is used for virtual meetings to external locations via the internet. The organization also has access to Internet-based web conferencing to enable virtual meetings, remote training and collaborative consultation via a dedicated service contract maintained by the CTCC/CHET with GoToMeeting & GoToWebinar. Virtual meeting, training and collaborative work sessions can be set up to accommodate many attendees, allowing simultaneous visualization of the desired material without the need for incurring travel expense. CTCC/CHET maintains a private Ethernet LAN containing approximately 32 servers and over one hundred Workstations. CTCC/CHET network services are protected from outside intrusion via multiple firewalls. Internet traffic is routed to the CTCC/CHET network via a connection through the University of Rochester Medical Center network. All traffic between workstations and servers is encrypted to ensure data integrity and confidentiality. External CTCC/CHET staff access to department computing resources is available on an as required basis via VMware View virtual desktop computers. These virtual computers are housed on servers within the University’s data center to ensure confidential data is not otherwise transferred to an un-trusted desktop or laptop computer at an employee’s home, public library, or other location. Standard Operating Procedures, training and a “Computing Code of Conduct” govern the processes by which users of the CTCC/CHET network are provided accounts, granted access to various assets, and guide in best practices for permissible use and maintenance of required security. In addition to the above servers, CTCC/CHET maintains a NetApp Storage Area Network (SAN) that provides storage for key documentation generated in support of clinical research. The SAN, with redundant processor boards and power supplies is configured as a RAID 5 double parity device ensuring high availability and accessibility to data stored on the device. In addition, each disk shelf in the SAN contains spare disks to allow for immediate reconstruction of the array in the event of a hard drive failure. All other key servers not connected to the SAN for data storage also have similarly configured disk drives as either a RAID 5 (striped disk configuration allowing for hot swap) or RAID 1 array (disk mirror allowing for failover) providing similar protection against data loss or inaccessibility. The Windows Server environment is additionally used for office automation based upon the Microsoft Office Suite (Microsoft Office Professional including, Word, Excel, PowerPoint, Access, Publisher and Outlook). Servers and individual PCs are protected against viruses via the centrally administered Sophos antivirus products. All end user computing resources are regularly updated to protect against data loss and viruses via a centralized Windows Server Update Services (WSUS). The workstations use the Microsoft Monthly “Patch Tuesday” as a marker for CTCC/CHET wide monthly updates. CTCC/CHET Server updates are completed in a way that is compliant with FDA CFR 21, part 11. CTCC/CHET windows workstation environment is also protected with whole disk encryption support from Checkpoint PointSec-for-PC. This allows CHET/CTCC to maintain a fully encrypted environment. The Unix and Linux servers provide high performance data processing in support of CTCC/CHET applications which use the Oracle 10g database engine. The Unix and Linux servers are also host to the primary environment used for SAS data processing and analysis jobs. A wide array of equipment is readily available to CTCC/CHET staff in a quantity and configuration supportive of a highly efficient workplace; the inventory of peripheral equipment includes various multifunction copiers, printers, scanners and projectors. CTCC/CHET maintains leased data center space from the University Information Technology Division which houses the above specified networking equipment and servers. The University data center is a secured facility with keyed access available only to select IT staff and management. The data center is continually monitored 24*7*365 by onsite personnel. Should equipment indicate an error, appropriate CTCC/CHET staff are contacted by data center personnel and other automated monitoring systems. All servers are maintained on conditioned power with redundant connections and redundant backup generators that automatically come online in the event of power failure to the data center. The entire CTCC/CHET environment is backed up nightly via an automated Symantec/Veritas Netbackup server with an attached StorageTek Tape Library Robot. Full backup tapes are rotated offsite on both a weekly and monthly basis with retention periods lasting at least one year. Comprehensive service and maintenance contracts are maintained (when available) on all hardware specified above. In the case of the Unix servers, a maintenance contract with 4 hour response is maintained with the expectation that in the event of a catastrophic failure, downtime of no more than 24 hours would be required to rebuild the environment from backup media. Windows servers are also maintained under service contract with same day on-site service stipulations. Codification of collected data to a standardized nomenclature is important for consistency in reporting and analysis and also helps to make the sharing of data with other parties a more seamless effort. The eClinical Dictionary module is used for the definition and maintenance of standardized data elements such as code lists used by other modules in the collection, processing and reporting of data. Each individual study requires the creation of a database and an application that is used for the collection and processing of data. The eClinical Management module provides a set of functions that allow for the definition of the database, data entry screens, data error checking/consistency programs, data query management, and monitoring programs. The module makes possible direct reuse of previously defined database and application elements from databases created for studies within a common disease entity or therapeutic area. This provides benefits in terms of reduced effort of staff and time required to prepare for a new study while supporting consistency in data collection. An important feature of eClinical Data Management is that study configuration provides for the ability to simultaneously configure the systems to enable use of paper based data collection and processing methods, entirely internet based electronic data capture and processing methods (eClinical Data Capture is configured through eClinical Data Management), or a mix of the two as might be required/desired for a particular study. In the case where internet based electronic data capture is used, the eClinical Portal module provides research sites with the ability to print for their own use worksheets that replicate the data to be captured and entered via the internet based data collection forms. This capability not only assists with work flow in deployment of internet based electronic data capture, but it provides extra assurance of ongoing uninterrupted collection and processing of data. Tracking regulatory documents and administering payments for participating research sites can be a time and labor intensive process. The eClinical CTMS application provides functionality to efficiently keep track of investigative site contacts, regulatory document status and the number of subjects / status of subjects enrolled into studies for each research site. For purposes of managing payments to investigators, eClinical CTMS is unique in that it is integrated with eClinical Data Management. This integration allows for the calculation of payments due based upon data that has been received and processed through eClinical Management. In this way, payments to investigators are based upon performance (e.g. enrollment of subjects and data collected) and helps to promote efficiency in the conduct and administration of studies. Manual paper based methods for data collection and processing are often time consuming, costly, and frustrating. Deployment of an internet based electronic data capture tool such as eClinical Data Capture in support of research studies provides cost savings, time savings, and improved data quality. Using this capability, research sites can enter data recorded on worksheets directly into an internet based electronic data capture application (eClinical Data Capture) to realize the following benefits: a.) paper based CRFs generally do not need to be printed, distributed, and managed; b.) data is checked for errors at the time of entry by sites, allowing for the majority of issues to be immediately resolved; c.) where data issues are identified in the database, the query identification, resolution and data correction process is facilitated electronically and seamlessly through the eClinical Data Capture application; and d.) the status and progress of subjects, sites, and study performance becomes instantly apparent, allowing for appropriate action by the study PI and CTCC/CHET. Effective collaboration across research networks requires a means for seamless communications. A secure collaborative workspace (eClinical Portal) serves as the central location for the dissemination of information while providing a means for interaction between all constituencies through secure document access and delivery. This secure web based study workspace provides a location for secure document exchange and version control which can serve as the primary means for distributing initial and updated protocols, amendments, model informed consent/assent and other regulatory documents (e.g., model FDA form 1572). This workspace may also contain data capture and processing procedures, site and personnel directories/contact information, site specific periodic status reports, initiative wide newsletters/reports on activities, upcoming data calls and data quality reports. The eClinical portal also provides facilities to host moderated asynchronous discussions, a means to access and complete various on-line requests and study suggestion forms, as well as a dashboard that can portray overall program and/or individual study level progress that can be used to readily inform and help promote continued timely participation by contributing research sites. Three to five million people suffer from Parkinson's disease in India, a country with only around 1,100 neurologists (Khadilkar 2012). Due to their sheer numbers and distribution, lack of awareness, and the prohibitive cost of seeing a doctor, most of these people will never see a neurologist, let alone one specializing in movement disorders. Reaching out to these people to collect data on their condition is critical for better understanding the prevalence of the disease, its context and the variation in symptoms. Current information about prevalence is based primarily on door-to-door surveys in a limited sample of people (Muangpaisan et al. 2009). With the widespread use of mobile phones throughout India, there is an opportunity to gather data from potentially millions with the disease. India ranks third in the world in the number of smartphone users, estimated at 117 million, and has a penetration rate of more than 10% per year (Rai 2014). Aim 1: To make the UPDRS universally intelligible across languages, cultures, and education levels, as well as intuitive and engaging, we will create a visual analog of the UPDRS, the “Visual Parkinson’s Disease Rating Scale” (VPDRS). Our intent is for the VPDRS to enable more widespread, diverse, and consistent responses from Parkinson’s patients, and to promote greater collaboration between Indian and U.S. researchers. We have experience creating visual taxonomies and administering the UPDRS to patients. Aim 2: To improve the VPDRS visuals’ comprehensibility and ability to serve as proxies for spoken versions of the UPDRS questions, we will evaluate them through clinical observations of English- and non-English-speaking patients and controls in India and the U.S. This evaluation will span the second year, where the VPDRS will evolve as it is iteratively validated against the UPDRS in new patients. During this time, this collaboration will establish common protocols for presentation and evaluation of the questionnaires and a shared understanding of the types of responses gathered from patients. VPDRS data will not be used to inform medical care, as the UPDRS will still be used as the primary assessment tool. Our team includes clinical experts in Parkinson’s who have enrolled patients in the U.S. and in India. Aim 3: To administer a consistent and widely accessible implementation of the VPDRS, we will deploy it on a mobile phone application, and store the data on server technology that we have developed and will establish in India for managing large-scale data collection from mobile devices in future studies. 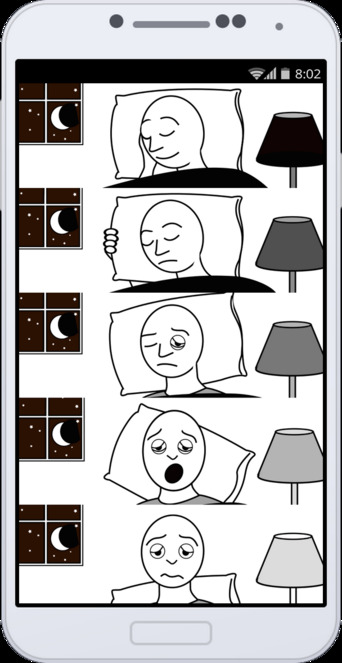 We will be able to take advantage of the experience we have gained from our iOS mobile phone application that captures sensor data and monitors variations in Parkinson’s symptoms (Arora et al. 2013) and includes UPDRS questions. Exploratory Aim 4: To facilitate future studies between Indian and U.S. collaborators, we will strive toward a better understanding of consent and research approval in each country. Over the course of the project we will hold governance/consent discussions across institutions, with a goal of incorporating our fully electronic consent process in the VPDRS app for future epidemiological studies. To ensure that our partners and others in India are able to build on this research, we will make all of our work open source and freely available, including the visual assets, the mobile app code base, and all research materials. Upon completion of all the Aims, we intend to conduct epidemiological studies with our collaborators to better quantify Parkinson’s prevalence, incidence rates, and symptom variations throughout India (current estimates are based on limited door-to-door surveys (Muangpaisan et al. 2009). These studies could also gather demographic and ethnographic data to explore various potential factors in the etiology of Parkinson’s and inform evidence-based policy in India. Further development of the mobile app to include capabilities of other apps we are piloting would enable us to correlate these surveys to sensor data captured by the phone. Another long-term goal of this project is to one day help triage patients at a vast scale, to ensure that those most in need receive treatment, alleviating the burden on doctors and hospitals. The majority of the large population in India suffering from Parkinson's disease will never see a neurologist, due to the relative shortage of neurologists (Khadilkar 2012), lack of patient awareness, and the prohibitive cost of seeing a doctor. This is devastating for two reasons. First, if these patients are not properly diagnosed, the probability of their being properly treated is low, and the primary treatment, levadopa, could help many of these people to manage otherwise progressively crippling symptoms. Second, the data that could be garnered from these millions of people would help us better estimate the prevalence and incidence rates, which are known to vary significantly across India, from as low as 14 to 41 per 100,000 to one of the highest proportions in the world: 328 per 100,000 in Parsi communities (Bharucha et al. 1988), and is believed to be twice as high in rural as in urban areas (Gourie-Devi et al. 2004). Without a clear understanding of the distribution of the disease and the severity of its symptoms, it is impossible to know how and where to best intervene. What is needed is a means of gathering data from vast populations to better understand the distribution of Parkinson’s and the variation in its symptoms, ultimately to aid in its diagnosis, determination of symptom severity, and prediction of disease progression in individuals. Toward these ends, we propose to create a novel system for enabling widespread collection of Parkinson’s-related information. The MDS-UPDRS Parkinson’s rating scale: A primary difficulty in gathering survey data from across India is the country’s great diversity of cultures and languages, which makes it difficult to present a commonly intelligible set of questions. The most commonly used scale in the clinical study of Parkinson's disease throughout the world is the Movement Disorder Society’s Unified Parkinson's Disease Rating Scale (MDS-UPDRS) (Ramaker et al. 2002). This scale consists of well validated, text-based questions covering different categories of symptoms. The original questions are written in English, and some groups have attempted to translate some of these questions into other languages, such as Hindi (http://www.movementdisorders.org/MDS/About/Committees--Other-Groups/MDS-Task-Forces/Task-Force-on-Development-of-MDS-UPDRS/MDS-UPDRS-Application.htm). Translations are inherently imperfect, and the UPDRS has not been translated into most of the languages on the planet. And even if the UPDRS were translated into every language, there are vast numbers of people who cannot read well, let alone read a Parkinson’s questionnaire, and having someone who reads well administer these questions verbally to those who don’t read well is an unreasonable expectation across a large population. The ideal would be a universally intelligible set of questions, presented without text or audio, such as pictorial representations of the content of the questions. We propose in Aim 1 to introduce just such a set of visual analogs to text-based survey questions - the Visual Parkinson’s Disease Rating Scale, or VPDRS. In Aim 2, we propose to ground this visual rating scale in the text-based UPDRS. Mobile phones to collect data: To get a representative sample of Parkinson’s patients in India requires incredible outreach using conventional methods. For example attempts to gather data via door-to-door surveys is an extremely limited approach (Muangpaisan et al. 2009). Mobile phones are becoming widely available in India, which is third in the world in the number of smartphone users, estimated at 117 million, after the U.S. and China, and has a penetration rate of more than 10% per year (Rai 2014). There is a huge range of devices from very basic, which support just calling and SMS (telephony services) to basic multimedia options, to middle-end and high-end smartphones. The scenario in rural India also varies from telephony devices to feature phones with modest multimedia capabilities with GPRS/data (for connecting with remote servers and the Internet), and basic smart phones are becoming more prevalent as well; people generally go for low-cost devices which have multimedia capabilities (for loading songs, films, etc.). The primary technologies include Java-enabled basic multimedia phones, Android, and Mobile Linux (from China), as well as CDMA phones. Android devices are the most obvious devices to target for epidemiological studies, given their low cost, technical capabilities, and increasing use, particularly in rural India. Their prices are going down, and currently range from Rs. 3000 ($50) to Rs. 6000 ($100). There are cheaper Chinese devices but they have their own proprietary platforms and are hard to develop applications for. We propose in Aim 3 to implement our VPDRS questionnaire as an Android app for widespread accessibility across India, and indeed, the world. This will make it possible for us to later conduct the largest epidemiological study of Parkinson’s disease. Aim 1 is innovative since it will introduce the world’s first universal visual representation of a neurological rating scale. The VPDRS will construct visual icons and animations that correspond to the text questions in the UPDRS. Whereas attempts are currently underway to painstakingly translate the UPDRS into different languages, this Aim would introduce a universally intelligible representation of the questions that will span languages, cultures, and education levels. Another innovative aspect of this Aim is that we intend to transform the dry text of these questionnaires into a more visually engaging experience, necessary for keeping participants involved in a given study. This is critical since one of the goals of this proposal is to prepare for epidemiological studies where participants everywhere, not just those entering a hospital, would need to be enticed to use, and continue using, a mobile phone app implementation of the VPDRS. Aim 2 consists of an evaluation study of the VPDRS. There are three innovative aspects to this Aim: (1) It will measure how closely the scores obtained using the visual analogs of the UPDRS questions correlate with the conventional text versions, in an iterative manner. That is, the evaluation study will be conducted in many stages, where the visuals will be improved at each stage for a new group of participants, while also presenting the revised questionnaires to the same participants. (2) For a given question, the effectiveness in conveying the question will be assessed for static icons as compared against moving stimuli (animations). (3) This will be the first study that directly compares UPDRS responses by Indian and U.S. participants. Aim 3 takes the innovative approach of implementing both visual and textual rating scales in a mobile phone application, for consistent presentation and for later widespread use in epidemiological studies and monitoring of patients’ health. A mobile phone implementation makes it possible to reach hundreds of millions of people compared with the extremely small number of patients who are administered the UPDRS by neurologists in the patient’s primary language. Exploratory Aim 4 will attempt to bring fully electronic consent to Indian research studies, which would herald a new era of conducting health research using mobile devices in that country. investigator to ensure completeness and clarity… Part III has instructions for the rater to give or demonstrate to the patient; it is completed by the rater. Part IV has instructions for the rater and also instructions to be read to the patient. This part integrates patient-derived information with the rater’s clinical observations and judgments and is completed by the rater. In this project, the VPDRS will encompass all self-administered questions of the MDS-UPDRS (Parts 1B and 2) and we will also make an attempt to include and evaluate clinically administered questions from Part 1A. We will construct two types of visuals for each question: a static graphic and a simple animation. We will create the static graphics as vector-based images and the simple animations as sequences of these images, and convert them to the format most suitable for presentation by the Android app. The static graphic is intended to represent the condition described in the question using an iconic or cartoonish visual. For some of the questions, it will suffice to portray the condition outright, such as with problems with sleep, daytime sleepiness, eating, dressing, hygiene, etc. For behavioral or cognitive conditions that do not have a clearly outward expression, such as pain, light headedness, etc., we will employ the most universally intelligible semiotics in Indian and U.S. children’s comic books and comic strips. And for questions related to motor activities, we will incorporate indicators of motion in the graphic. The principle advantage of the static graphic is that it places the lowest demands on the mobile device and should be viewable on even the lowest end Android devices. The simple animation will consist of a two- or three-step sequence of pictures corresponding to the static graphics above. Animation can overcome potentially ambiguous semiotic cues. For example, movement can be directly represented as a moving sequence of images rather than with imaginary lines, arrows, blurring, or repeated images. Animations could also allow for the full screen to be used, by sequentially displaying the condition at different levels of severity rather than having to display all levels simultaneously, as is the case with the static graphic. We do not include video clips with real people and objects for four reasons: (1) video production of patients raises concerns we don’t face with cartoons, (2) inclusion in an app would place the greatest demands on the mobile device, (3) videos richly represent their subject matter, which can result in distracting details that are avoided for clarity in cartoons (which can also more easily emphasize or exaggerate salient features), and (4) because of their realism, videos portray people and environments in ways that can be too culturally specific, another issue that is less relevant with cartoons (Fig. 1). Over the past week, have you had trouble going to sleep at night or staying asleep through the night? Consider how rested you felt after waking up in the morning. 1: Slight: Sleep problems are present but usually do not cause trouble getting a full night of sleep. 2: Mild: Sleep problems usually cause some difficulties getting a full night of sleep. 3: Moderate: Sleep problems cause a lot of difficulties getting a full night of sleep, but I still usually sleep for more than half the night. Aim 2: To evaluate the VPDRS, we will have coordinators in two locations in India (government hospitals in New Delhi and in Hyderabad), and one coordinator in the U.S. administer both the UPDRS and VPDRS to Parkinson’s patients and healthy controls. Our Indian coordinators on this proposal are Dr. Madhuri Behari, Professor of Neurology at the All India Institute of Medical Sciences in New Delhi, and Dr. Rupam Borgohain of the Department of Neurology at the Nizam's Institute of Medical Sciences in Hyderabad. Each of these coordinators see 30-40 patients each week, and many of these patients return every few months, so there is an opportunity not only to administer the UPDRS and VPDRS to thousands of patients over the course of the study, but also to conduct a longitudinal assessment of the evolving visual stimuli on some of the participants. Dr. Saloni Sharma, working with Dr. Karl Kieburtz at the Center for Human Experimental Therapeutics, University of Rochester Medical Center, NY, will serve as our U.S. coordinator for the evaluation study. The evaluation study will undergo multiple stages. At each stage, the current set of visual stimuli in the VPDRS and the conventional UPDRS are presented to participants one question at a time. In the UPDRS, a participant responds to each question in the form of a numerical rating, or score, from zero to four indicating normal to severely impaired behavior. For the VPDRS, the participant responds to each question by selecting one of five images, corresponding to the 5-point scale. If the VPDRS score is similar to the corresponding UPDRS score for a given question, and this holds across the participants in the study, then we consider the VPDRS’s visual representation to be a potential proxy for the textual UPDRS question. If, on the other hand, the correlation between participants’ UPDRS and VPDRS scores for a given question is low, then we will update the visual stimulus and reassess it at the next stage of evaluation. Updating the visual will only occur after conferring with the coordinators, Parkinson’s experts, and graphic designer colleagues. We will also explore the possibility of crowdsourcing interpretations of the visuals (McMaster 2012). We will determine which type of presentation, static graphic or simple animation, works best for each question. 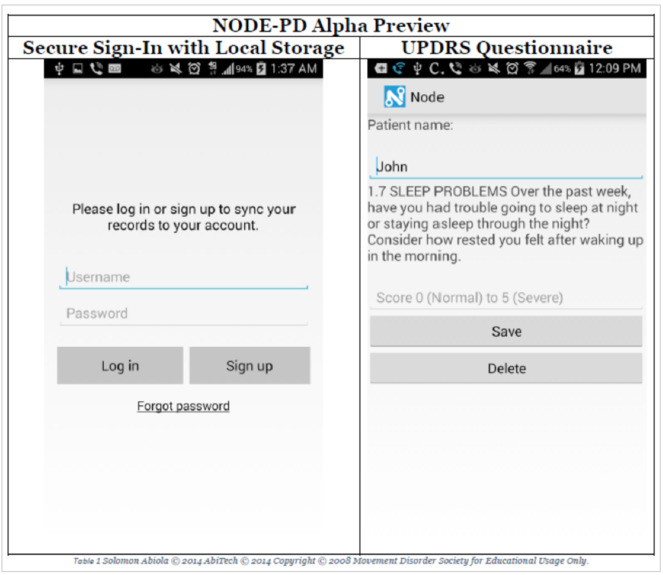 Aim 3: To implement the VPDRS as a mobile phone app, we will draw from our experience developing other health-related apps, using Node (Abiola 2013) to develop a new Android app. Our collaborator Solomon Abiola (see LoS) helped to develop an initial prototype (see Fig. 2) based on one he tested for monitoring contagion event likelihoods, using real-time sensors and questionnaires with geolocation. As an epidemiological tool, it was successfully used with support from the NSF (http://www.nsf.gov/awardsearch/showAward?AWD_ID=1516340) for an Ebola study in Nigeria. He designed it to be adapted for various global health applications, and given the similar infrastructural limitations of India and Nigeria, we intend to adapt this app for use in assessing Parkinson’s disease symptom severity through the UPDRS and VPDRS. The adapted version will be able to store the data locally on the phone and upload to a server (see below) when a data network is available. This screen shows a pre-release version of Node, which will support the VPDRS/UPDRS modules. Here we present a means by which a person administering a questionnaire can securely log into and manipulate patient information locally and through cloud services and lastly an example clinician-administered UPDRS question. Solomon will provide a licensed version of Node free for our research through a shared repository and collaborate as needed with ZMQ to improve the backend of the application to support our Bridge server (see below). The current prototype will support local saving and credentialing, in addition to the UPDRS questions. Additional work will be done by ZMQ: (1) to incorporate images with the UDPRS, (2) VPDRS and (3) add support for the application to upload data to the Bridge server. ZMQ will build upon the existing Node codebase by altering the code around the questionnaires to incorporate images. Upon successful prototyping, the database where the data are saved will be switched to the Bridge server. Following the successful implementation of an image enhanced version of the UPDRS application, a video layer will be added to the Node platform to support VPDRS animations. Bridge server clone: Data collected using the app will be stored on a clone of the Bridge (https://sagebionetworks.jira.com/wiki/display/BRIDGE/Bridge+REST+API) server-side technology developed by Sage Bionetworks to be built in India. Bridge is designed to support the design and execution of adaptive clinical trials delivered through smartphone platforms. Participants in a study interact with the Bridge server through an app which is custom designed for each particular study. The Bridge server provides a way to configure a study with a set of survey questions to ask study participants and way to schedule times for the various survey and app data collection tasks to run. Storing this configuration on the server allows researchers to dynamically adjust the study as data are collected without distributing new builds of the app to participants. The Bridge server provides services for study participants to create an account, authenticate, and manage informed consent to participate in a research study. The app will periodically save survey and sensor measurements to the server; client-side SDKs help manage transmission of his/her data over intermittent mobile network connections. Study data are stored separately from readily identifiable user account data so that study participants can be de-identified and the data shared, while protecting their anonymity. Exploratory Aim 4: We will introduce the Indian collaborators to Sage Bionetwork’s e-consent process through demonstrations of Sage’s iOS Parkinson app and teleconference discussions with Sage’s governance team (see below). Our iOS Parkinson app includes an electronic consent process Sage developed that assists participants in their understanding of what they are getting into by taking part in the study. Our e-consent process is the first fully electronic consent process used in a Parkinson’s disease study conducted on a mobile device, and would be useful to incorporate in the VPDRS app for future epidemiological studies. Freedom Polio Project (http://www.freedompolio.org): Largest mhealth project for managing polio and routine immunization of over 1.5 million children below the age of 15. Also, ZMQ has developed over 40 games for improving healthy behaviors and delivered over 2,000 hours of health training content over mobile phones. Android Parkinson app: Our collaborators Dr. Ray Dorsey and Dr. Max Little have developed and tested an Android app for people with Parkinson’s that does not include UPDRS survey questions, but includes activities (finger tapping, reaction time, gait, balance, phonation) that record sensor data to infer severity of Parkinson’s symptoms. In their pilot study, 20 participants performed an average of 2.7 tests per day (68.9% adherence) for the study duration (average of 34.4 days). The mean error predicting UPDRS (range 11-34) was 1.26 UPDRS points (SD 0.16). iOS Parkinson app: Sage Bionetworks and partners are currently alpha-testing an iOS app that includes the activities in the Android Parkinson app, passive sensor feeds, and select UPDRS survey questions. If the sensor data collected during these activities enable accurate UPDRS assessment, a mobile app could potentially be used in place of Parts 3 and 4 of the MDS-UPDRS questionnaire. While we would like to incorporate the VPDRS in this iOS app, Android has far greater reach in India, and makes better sense for use in a widespread epidemiological study in India. Contingencies: Aim 1: If certain questions simply fail to translate into widely interpretable visual representations, then we will omit these questions in the version of the VPDRS we use in our later epidemiological studies, and submit these questions as open challenges to the graphics community. Aim 2: If the evaluation study in one location is unable to enroll participants, we should still be able to enroll sufficient numbers, given that we will conduct evaluations in at least three hospitals. Aim 3: In the unlikely scenario that the app implementation is unable to be completed within the funding period, we can still satisfy Aims 1 and 2 by presenting and evaluating the VPDRS on a computer screen or as printouts. Plans for coordination of research and activities: In addition to monthly teleconference meetings, we are planning on having four in-person meetings over the course of the two-year grant period, two in India and two in the U.S. The meetings in India will be workshops with training sessions in the use of the latest version of the VPDRS mobile phone app, held in months 4 and 15. A representative from ZMQ will demonstrate the app’s use to the Indian coordinators and collaborators, and to three people attending from the U.S. At these workshops, the India study coordinators will also demonstrate the protocol they follow for administering the MDS-UPDRS and VPDRS. Sage Bionetworks in Seattle, WA will host two 3-day meetings (months 1 and 12) to confer with the Indian study coordinators on the construction of the VPDRS visuals, on the analysis methods for evaluating the VPDRS, and on e-consent and international governance issues (Fig. 3). This Gantt chart provides an estimate of the relative timing and duration for achieving each of the Aims. Milestones: A full set of initial VPDRS visuals will be constructed by 6 months, with iterative improvements through month 18. While the VPDRS will be administered to patients continually, visuals will be updated monthly, and the app will be updated about every 4 months after an initial version is completed by month 4. Patients over 18, receiving medical care at three clinics and who routinely fill-out the MDS-UPDRS for diagnoses or suspected PD will be invited to participate in this study. Due to the nature of the study and the disease we will not enroll participants from vulnerable populations as defined by HHS. We plan to enroll about 600 individuals of any gender, ethnicity, socioeconomic status or literacy from 3 clinics over the course of the study for a minimum total of 1800 participants. The three clinics are the Strong Memorial Hospital in Rochester, NY, and in India the Nizams Institute of Medical Sciences (NIMS) in Hyderabad and the All India Institute of Medical Sciences (AIIMS) in Delhi. Both NIMS and AIIMS are large, free, government run clinics providing care for people from diverse backgrounds and are seeing about about 30 to 50 patients with PD weekly. Volunteers will be recruited from 3 collaborating sites. Prior to any data collection, collaborators will meet in the US and in India to review and get training about implementing the consent process and the protocol. Each site has assigned a study coordinators as point of contact to address questions from staff and participants. They are Dr. Saloni Sharma, Dr. Behari, and Dr. Borgohain. The 3 collaborating recruitment sites will administer consent, run the protocol and transfer the study data into our IRB-approved, secure online BridgeServer. This study compares a well-established PD survey, the text-based MDS-UPDRS, with a picture-based version presented either in a paper format or through a mobile phone application. Patients will be informed about the study during their regular clinic’s visit. Interested volunteers will confirm their agreement to participate. Trained medical personnel will administer the informed consent process as well as the protocol. Taking part in this study will take about 10-15 minutes and will not impact the care that they otherwise receive. Patients will only participate once, so the total time per patient will be 10-15 minutes. Taking part in this study will not affect participant’s medical care. The study materials are survey instruments. Information and data collected include responses to the MDS-UPDRS and to the VPDRS surveys to be compared to help refine the VPDRS as well as observation from the study staff regarding ease of use and understanding of the visual icons in the VPDRS. Additionally, we will provide a study information sheet and an Informed Consent form. Each participant will need to confirm their agreement to take part in the study by signing the Informed Consent form. The signed form will be collected and retained at each participating sites. Note that all materials provided to participants will be submitted for IRB/ethical approval prior to being included in the study. 1.e. Potential Risks: This is not a treatment study and there is no major medical risk associated with the collection of data through these surveys. Potential risks are to patient privacy and data confidentiality. These risks are low because we are taking measures to protect participant’s privacy when they answer the surveys and we handle personal information with care as described in the next section. 2.a. Recruitment and Informed Consent: Patients already receiving medical care for PD will be invited to participate in the study during their regularly scheduled appointment. Participation is entirely voluntary. A trained medical professional and study staff will either hand out or read the study information and consent form in the person’s native language, ask if they have questions, answer any questions and then the person consenting will sign the consent form. There is no financial benefit to recruit individuals and no recruiting bonus. 2.b. Protection Against Risk: How risk will be minimized, additional protections for vulnerable populations; medical/ professional intervention for adverse events. In Person: The medical professionals administering the study will be trained on informed consent and protocol administration. This study compares two tools for PD assessment and is not a medical treatment or intervention study; therefore medical risk is minimal. The consent process and study participation will occur in familiar clinic setting. Sage Bionetworks maintains strict information technology procedures to safeguard participant information and to prevent improper access. The data security measures are a combination of Privacy-Enhancing Technologies (PET) options and policies/processes for data handling by qualified users. Briefly, the research data will be de-identified and encrypted on the smartphone, aggregated with data from other participants on BridgeServer - a platform designed to support the design and execution of adaptive clinical trials delivered through smartphone platforms - and then transferred to Synapse - a data analysis platform - where it will made available for analyses. The participant’s identity will NOT be sent from the phone to Synapse. 3. Potential Benefits of the Proposed Research to the Subjects and Others: The goal of the study is to develop a universally accessible visual version of the validated diagnosis survey to detect symptoms and assess progression in PD. One benefit of this project is the increased awareness of PD symptoms in diverse, multilingual population and to engage participants with various literacy proficiency. This study will not affect medical care otherwise received by participants. Since the participants in the study are already receiving treatment for PD, the individual participants will receive no direct treatment benefits. Once validated, the VPDRS could have significant treatment and diagnosis benefits to millions of people not only in India but around the word with PD. 4. Importance of the Knowledge to Be Gained: The long-term knowledge gained from this project may be the creation of a valid, economical, and easy to use way for people around the world with PD to monitor their symptoms. Additionally, the data collected and analyzed by researchers may provide insight into better ways to monitor and treat this disease. Further, the icons being developed may be useful for apps related to other diseases and could become a standard in mobile-enhanced care. The study data collected through the app will be stored in BridgeServer and coded before being transferred to Synapse for analyses. Sage Bionetworks acts as a steward of the data, tools and analysis available through BridgeServer and Synapse, and is committed to safeguard the security and protect data. BridgeServer: Participants’ accounts and contact information are kept separated from the research data on BridgeServer and only accessible to the IT staff and study organizers. An independent account management service will automatically generate a unique random identifier (code) that will be associated with participant study data, and maintain an encrypted mapping between participant account and participant study data. The coded study data that don’t include readily identifiable information can be analyzed while protecting participant’s anonymity. Once coded, study data will be aggregated with those of other participants, encrypted, hosted in Amazon Web Services (AWS) and accessible on the Synapse platform for analysis. Researchers analyzing the coded study data will not know the identity of the participants. Amazon is the leader in cloud computing and provides world-class security (http://aws.amazon.com/security/), and supports solutions to comply with strict federal requirements including the standards of the Health Insurance Portability and Accountability Act (HIPAA) (http://aws.amazon.com/compliance/). AWS end-to-end security and end-to-end privacy measures ensure the confidentiality and integrity of the data. In addition, in the event we randomly audit and find data or features that we consider potentially identifiable we will make every effort to edit/remove the information prior to aggregating the data onto Synapse. Synapse data analysis platform: The aggregate coded study data will be accessible through Synapse for analyses. Synapse is an informatics platform for collaborative, data-driven science that combines the power of community-based modeling and analysis with broad access to datasets to enable the development of more predictive computational models of disease. Synapse records how data is used by analysts, versions data, and codes and captures analysis history. We have developed transparent governance policies and robust procedures to enable the contribution and use of human data for research purposes while protecting personal information and respecting individual’s expectation for confidentiality. These governance policies and procedures have been developed with our independent ethics advisory board chaired by Dr. Kelly Edwards, associate Professor in the Department of Bioethics and Humanities at the University of Washington, and have been approved by the Western IRB (IRB approval reference: 20112068). The coded study data stored in Synapse will only be available to registered users worldwide who agree to abide by the governance terms in order to access data, to using the data in an ethical manner, to do no harm and not attempt to re-identify or re-contact participants unless they have chosen to allow them to do so. AK conceived of and wrote this proposal.